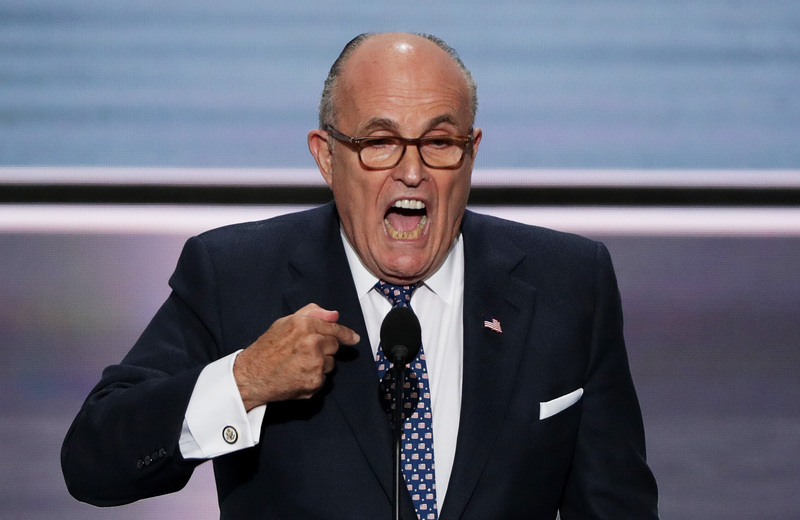 If you're interested the summary version of last night's Republican National Convention, just take a look at any one of the numerous photo or video stills taken of Rudy Giuliani's face during his convention speech. He's shouting, glaring, and letting rage burst out of his face from all angles. It looks like he's trying to scare you. And essentially he is. That's the Republican's only hope this November. The message behind his speech and many of the others we've seen so far at the convention are about ISIS, crime, and attacking our enemies. That's the message about America they want you to hear — not that together we can improve the country but that we're on the brink of impending doom. The theme of day one at the RNC was even "Make America Safe Again." Couple that with Giuliani's delivery and you have an honest-to-goodness American Horror Story mini-episode with the most political of themes. The vast majority of Americans today do not feel safe. They fear for their children and they fear for themselves. Then, just in case you weren't already living in fear, he hammers home every possible point about why you should be. People are afraid, he argued, "for our police officers who are being targeted." Pause for prayer. Then of course there's the "major Islamic extremist terrorists attacks on us and our allies." Why? "Islamic extremist terrorism." Cue — I'm not kidding — cheers from the audience. The Republican world view boils down to fear and cheering for ISIS. God help us. Giuliani is not alone in his fear-mongering Monday; he's just the most famous to do so, at least arguably. Scott Baio, Willie Robertson, and Antonio Sabato Jr. also spoke. Baio said, "Our country is in a very bad spot. You can feel it, and you can see it everywhere. There's no stability. Nothing seems right. All the things we hold dear are being attacked every single day." Later in the evening, Retired Army Lt. Gen. Michael Flynn spoke, mostly about war. "My God, war is not about bathrooms. War is not about political correctness or words that are meaningless. War is about winning," he told the crowd in Cleveland. He doesn't think America is focused enough on our enemy. He criticized Obama's speeches, saying, "This, this has caused the world to have no respect for America’s word, nor does it fear our might." Uh oh. Freshman Iowa Sen. Jodi Ernst focused much of her speech on her 23 years of military service. Then she attacked what she sees as Obama's lack of leadership over the military, something she said would continue under Hillary Clinton. "As I travel across Iowa and around our great country, I hear from folks who are worried America is no longer leading but rather following from behind. Those concerns are echoed by our allies around the world and rightfully so. The question I hear, time and time again, is, 'Where is America's leadership?'" Ernst said. According to Giuliani, his face, and all the speakers Monday night, Trump is the answer to that leadership void they claim exists. "Donald Trump is a leader. He will reassert America’s position as the nation with the best values to lead the world," Giuliani argued. So until November, Republicans may argue he will make America safe again, but back in June likely voters thought Clinton would do a better job on national security. And she won't scare us in the meantime.